It almost feels like a dream. Standing in a marsh at dawn, the air cool and still, my breath fogging my camera as I awaited the warmth of the sunshine which was slowly starting to filter over the horizon. In the distance the murmur of rumbling ground began to seep into the quietness of the morning, awakening my senses with the fast approaching noise. I could hear the voice of the handler calling his group closer to him and could not help but to smile in anticipation of their arrival. The beautiful horses of Camargue. Once upon a time at the end of the fall, I spent a weekend at my first photography retreat set amid marshes and old villages located in what is known as the wild west of France, the Camargue. The purpose of the weekend was to learn about photography, the main attraction of the weekend was their magnificent horses. Indigenous to this area in France, the horses of Camargue are an ancient breed, considered to be one of the oldest in the world today with origin unknown but relating back to prehistoric horses found in France. Smaller than other common horses bred throughout the world, the horses of Camargue are born brown but, like many of us their hair turns to a lighter shade as they age, eventually becoming white gray for which they are known. 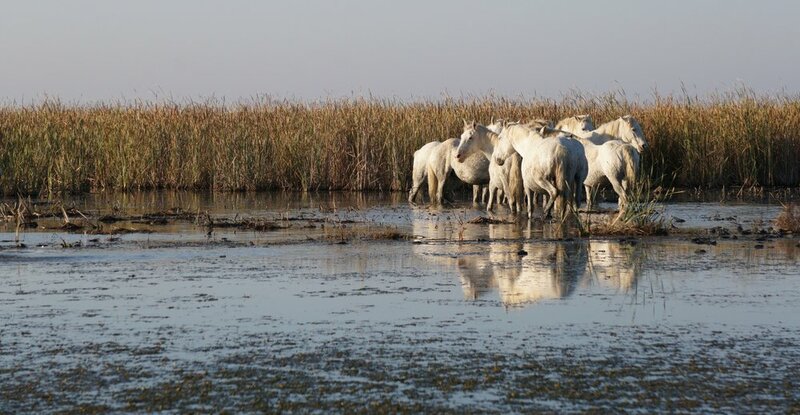 With a love of salt water they have often been referred to as “the horses of the sea”, evolving into the breed of today suited for living in the wetlands of France, living semi-feral amid the marshes of the Camargue. The riders, known as Guardians, are the real life cowboys of France, known for their traditional black hat and their trident (long stick). 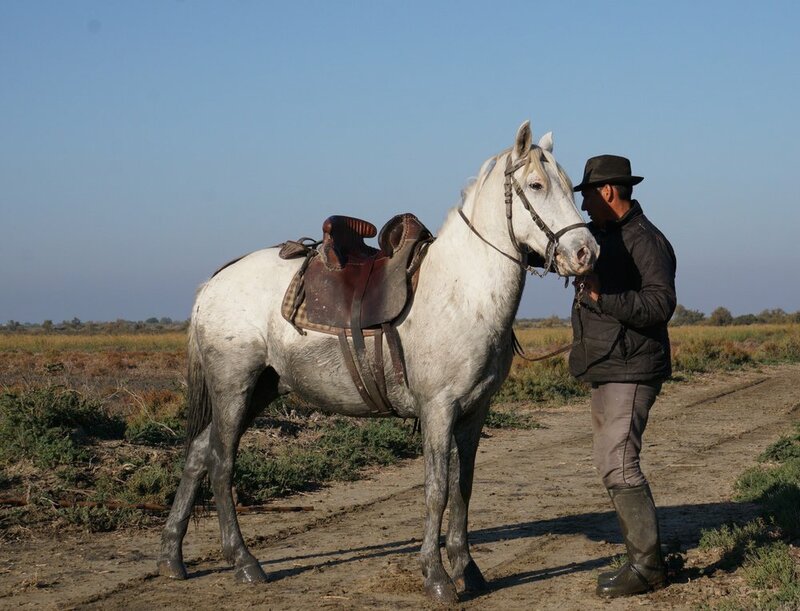 With traditions dating back hundreds of years, Guardians have lived in the Camargue using the horses in part for herding cattle and Camargue bulls, also native to this area. The devotion and trust of the Guardian and horse is visible, an understanding with a connection based on mutual respect and time. Animal lover aside, the unspoken bond is both inspirational and moving. The balance and cooperation of human with nature and animal, in complete and total harmony. I think back to that weekend and there are no words to express the beauty, the grace and the peacefulness of these majestic creatures. The elegance in their every move, they are strong but vulnerable, energetic but calm, mystical yet present. Galloping through the sandy lagoon, drops of water magically splattered the air like paint on a blank canvas. The droplets spraying the horses and coloring them from white to dark gray, their manes dancing in the breeze in unison with each step taken through the shallow, salty water. Although my camera did not capture every shot of the horses, my heart certainly did, and despite being covered in mosquito bites by the end of the morning, I was completely filled with joy. 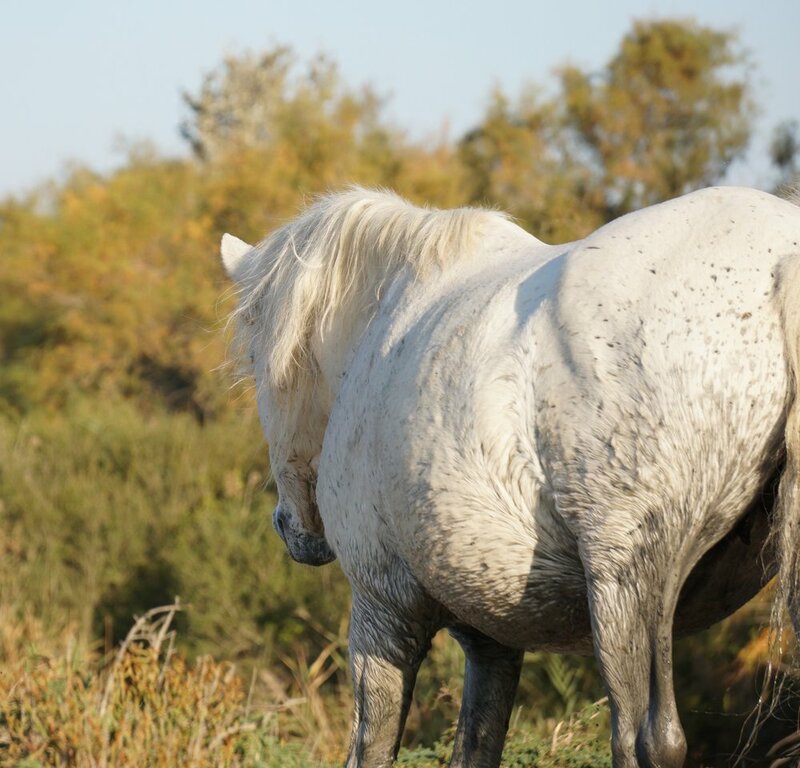 The natural beauty of the wild Camargue and the magnificence of their white horses was a very special backdrop for an unforgettable experience.